Remember the books you're looking for with Library List! Have you forgotten the name of the book you were looking for? Just bought a duplicate of a book you already had? 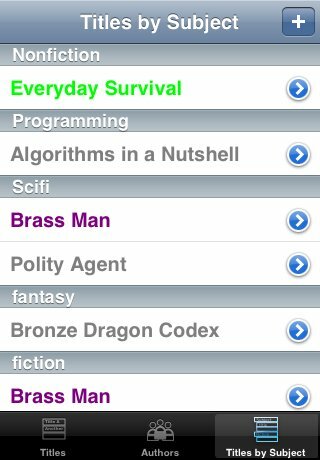 Now Library List gives you a convenient way to manage your list of books. 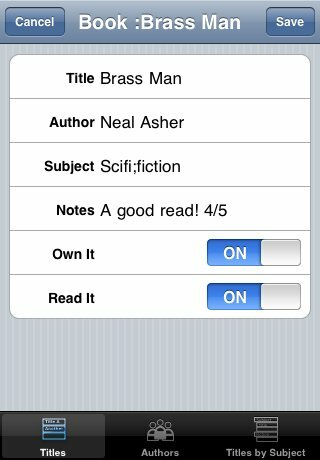 You can list books by title, author and subject! This application provides an easy to use list of books that sorts on titles and subjects! Uploads Now upload your list from your Computer to Library List! Here is a better breakdown of the columns. You do NOT need to use the quotes in Excel, but I use them just to try and make the instructions clear. 1. Author - Author of the book. If there are multiple authors you can add each additional author by separating them with a semicolon. So for instance the book "Good Omens" by Neil Gaiman and Terry Pratchett could have the author column listed as "Neil Gaiman;Terry Pratchett" or "Gaiman, Neil;Pratchett, Terry"
In the Subject view of Library List I can now find "Good Omens" under Fiction, Fantasy and Funny. 4. Notes: a spot for short notes about the book. 5. Read It: Have you read the book? If yes, fill the column with a Y. A blank or any other letter will be considered a no. 6. Own It: Do you own the book yet? If yes, fill the column with a Y. A blank or any other letter will be considered a no. Create the file then up load it using the form above. Create a unique identifier for the file. This unique identifier will be used to download your list to Library List on your iPod Touch or iPhone. Once you've uploaded your file, go to the Advanced Tab , select "Update List"
Exports Now export your list from Library List to your email! To export your list from Library List, Select the Advanced Tab, then Email List. Simply enter the email address to send your list to, or select an email address from your contacts list. Once you have the address entered, just click "Send". NEW! Available now with Imports and Exports! NEW! Change colors within the App! Change the color of the title if you have read the book. Change the color of the title if you own the book. Delete Books from Library List. Need to support two authors? Simply add a semicolon between the authors and both will show up independently in the author view. Not sure what subject to put a book under? 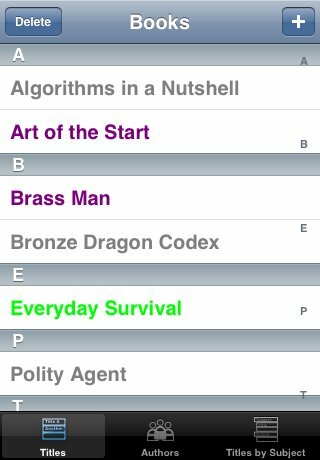 You can use a semicolon to have the title appear under both areas.